The Unhinged isn't just about shopping -- it's about dancing, too! It's great fun, but the trouble is, everyone there looks stunning. Especially Siggy. So I spent a lot of time putting an outfit together! On the way I also hit the gatcha for some plants, because I dig plants. 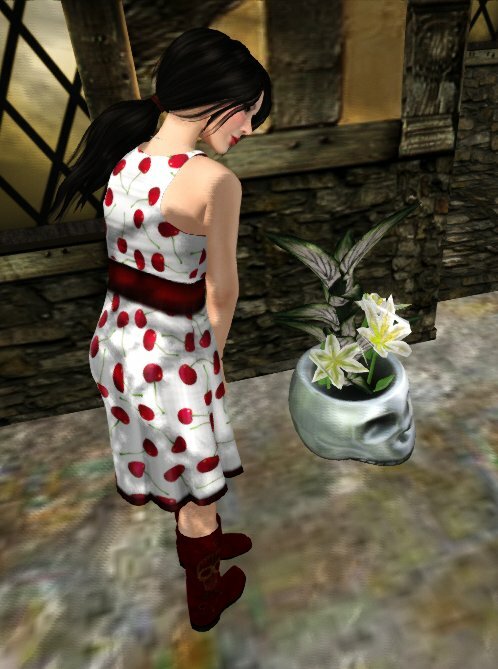 Arctic Greenhouse made a fun skull planter, to give that special welcoming touch to any garden. Arctic's Gacha is extra special, as you get a random chance of getting three items instead of just one... and I struck gold. I'm only showing my favourite one, but I got two others that I like a lot as well: a golden skull with red roses (Rare), and subtle dark purple flowers in a dark skull. Lassitude & Ennui has been my favourite shoe designer for a long time because of her attention to detail and the quality of the modelling and texturing. 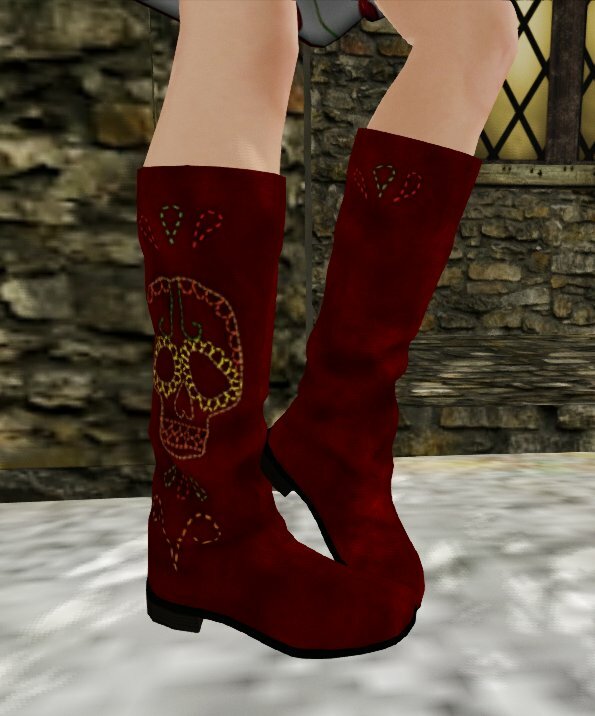 The mesh Sugarskulls boots she made for Unhinged are yummy. There's lots of colour - pink, brown, red, blue... I forget... the rare one is black/greyscale. The stitched skull blends perfectly with the main fabric of the boots. The red ones are my favourite. It's a mesh dress, with two sizes included. The standard size fits me like a glove. It moves nicely with the body -- good weighting! I like how cheery the cherry pattern is, and that it looks like it has some thickness to it (like a real dress). There's a bit of anti-aliasing going on at the back; it's a minor fault, as you'd really have to zoom right in to see it. The skull makes this dress edgy and quite versatile, as you can wear it with classy pumps, with worn Docs, or with the most punkish NewRock-like boots you can find on the grid. Or, indeed, with the Sugarskulls boots.